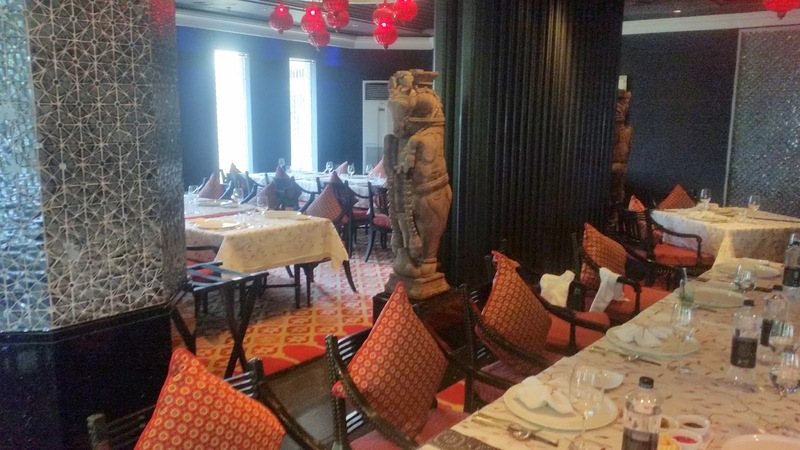 A few weeks back I was invited to The Hyderabad Marriott Hotel and Convention Centre to preview the newly launched set menu at Bidri, the Indian restaurant. Among the appetizers was a vegetarian kabab called Arbi Aur Moongphali Ki Seekh. As I was appreciating the mashed colocasia and peanut based preparation, Executive Chef Yogender Pal mentioned that this was a recipe from the foothills of the Himalayas, his own state of Himachal Pradesh. He also mentioned that Bidri was planning to host a pop-up event soon showcasing the cuisine of Himachal. 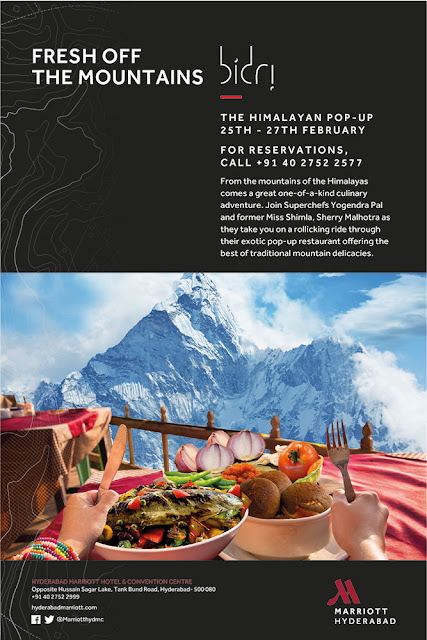 Based on that plan, the Himalayan Pop-Up has finally materialized at Bidri from 25th to 28th February. 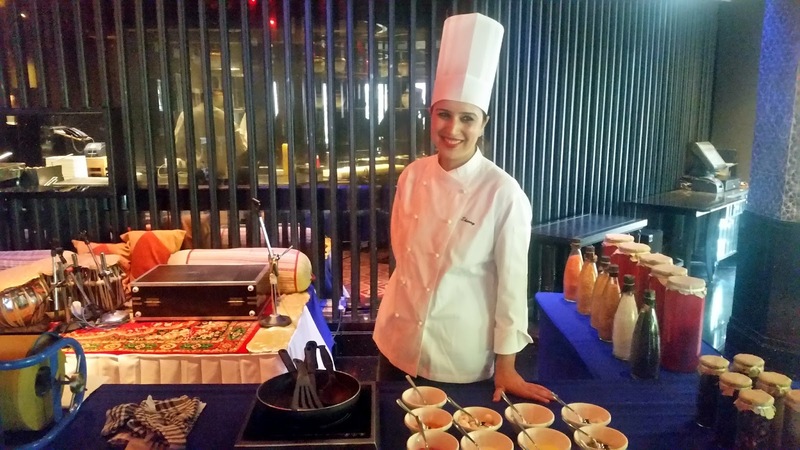 For this event, Chef Sherry Malhotra has joined the team from Mumbai, curating some delicious dishes for the promotion. A former Miss Shimla, Chef Malhotra picked up the secrets of Himachali cuisine from her grandmother and is perhaps one of the very few to promote this simple but delectable cuisine in other parts of India. Himachali cuisine stands out for its recipes which are easy to prepare with very basic ingredients. A range of dals and channa are used in the recipes, often due to paucity of fresh vegetables in the hilly areas. At the start of a preview tasting session of the pop-up, a few bloggers were invited for a cook-off of a particular item from the menu. The dish selected was Channa Madra. Chef Sherry explained to us that yoghurt and tamarind based gravies are very popular in Himachal – they are called Madra and Maani. We were given a bowl of Channa Madra to understand the desired taste. Then the recipe, as well as the ingredients, were provided to us. It was a simple recipe using chickpeas and lotus seeds in a gravy of whisked yoghurt and desi ghee along with a few ground and whole spices. We made our own version of the dish, which tasted nice, but in my opinion did not come out half as good as the original. But the process revealed to us the simplicity of preparation of Himachali dishes as well as gave us an idea of the major spices used there. After the cook-off, we proceeded for the sit down dinner to taste some of the items the chefs had shortlisted for us in a special tasting menu. 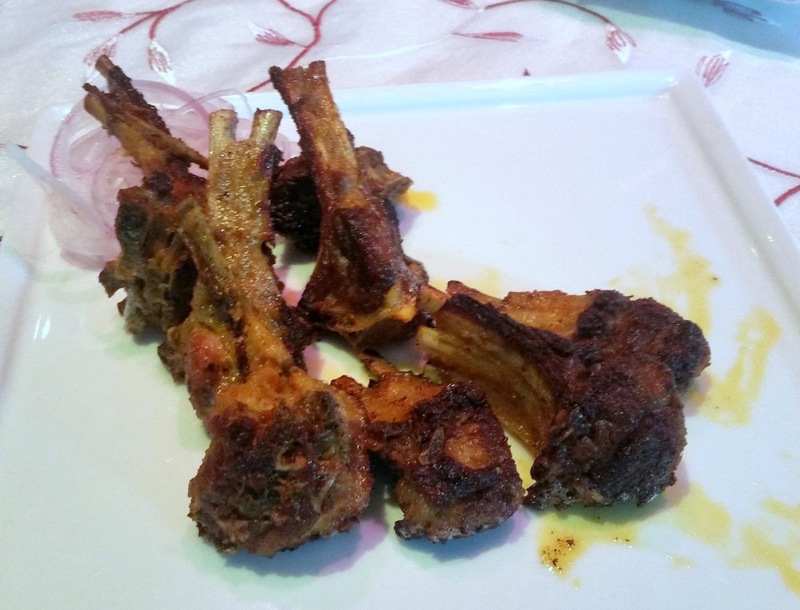 We started with some succulent Dahi ka Chaap – lamb chops braised in a saunf and milk based marinade. Fennel seed seems to be a popular spice in Himachal as Methi aur Saunf ki Murgh Chaap, a chicken leg preparation had it in abundance too. Among the vegetarian starters, I was glad to encounter Arbi Aur Moongphali Ki Seekh again. Channe Ki Tikki, a soft and flat shaped fried snack with chickpeas and tomatoes went well with the green chutney served on the table. There were a whole range of vegetarian main courses. The star of these was surely Nashpati Ki Sabzi. 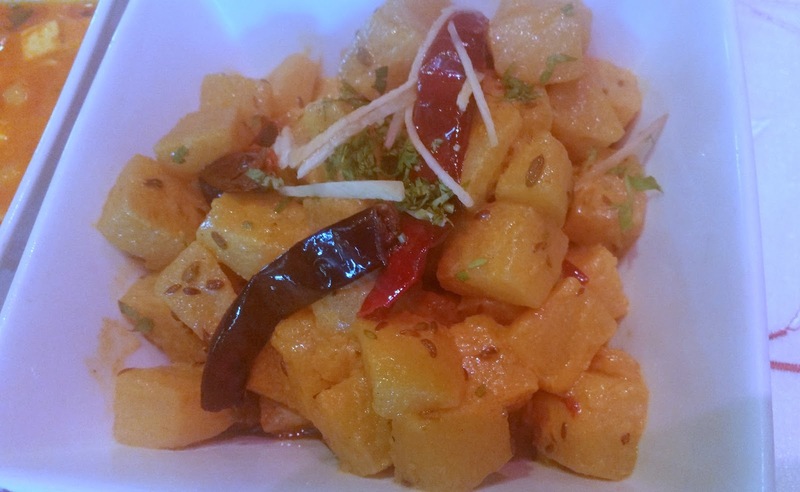 I had never had pears cooked as a vegetable, and the dish with fennel seeds and dried red chillies was soul food. 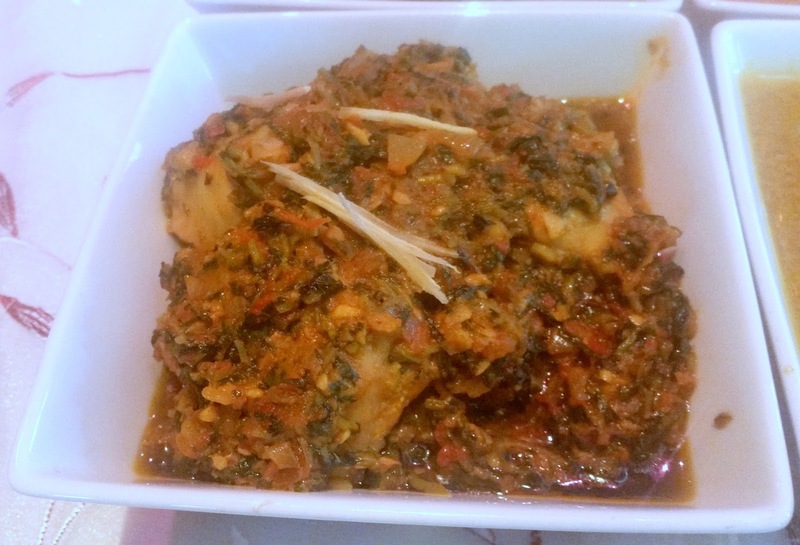 Sepu Wadi had urad dal pakodas cooked in a spinach base. Kaale Chana ki Maani was a tamarind preparation with spinach pakodas and black chickpeas – the curry tasted exquisite, and I like black channa in my sabjis. 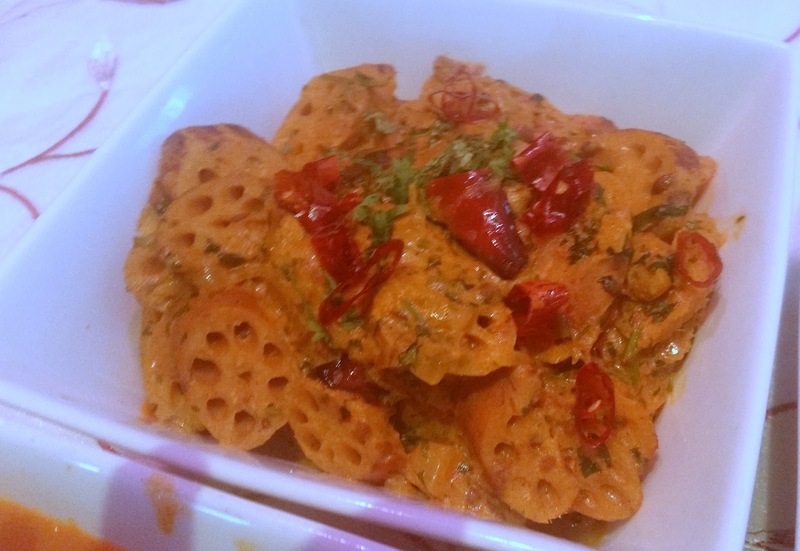 Other vegetarian items were Kaali Dal and Bhey – a preparation of lotus stems in yoghurt. 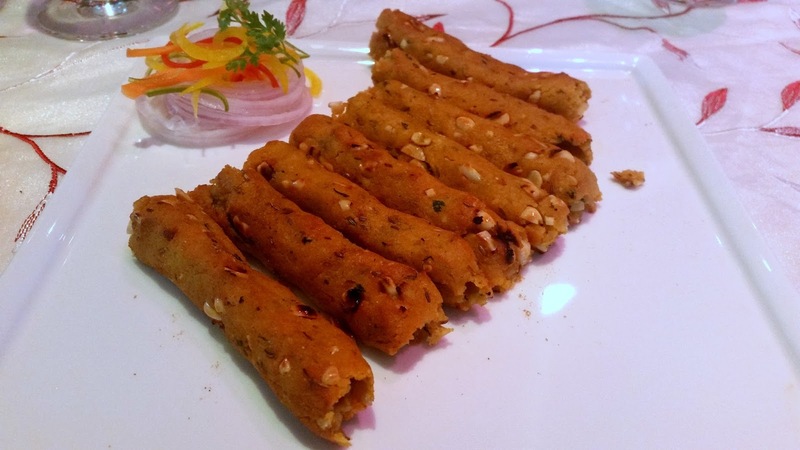 Among the non-veg items Methi Machhi stood out – again a simple dish with perfect flavours. There was Chaa Gosht, a mutton gravy in yoghurt which was just about decent. We had Tudkiya Bhat – a rice dish with tadka to accompany these courses, and Babru, the Himachali version of bhaturas with urad dal stuffing. An assortment of other Indian breads was served as well. 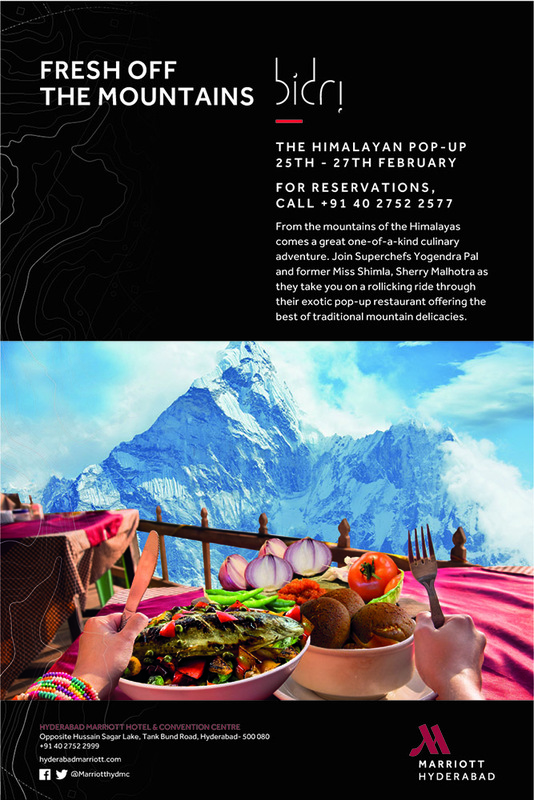 I noticed a few things on the tasting menu for the pop-up, which may also be the essence of Himachali cuisine in general. Yoghurt is widely used in preparations. Most of the dishes are not very complicated, use only the basic masalas, and depend more on the original flavours of the ingredients. 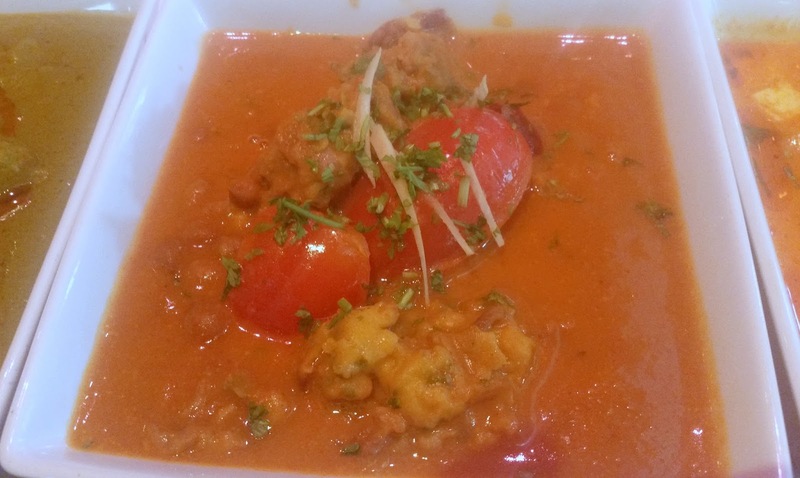 Many of the vegetarian dishes are prepared using lentils rather than vegetables – the concept of pakodas cooked in a gravy seems to be popular. And though the non-vegetarian items were decent, the vegetarian food really stood out. From the desserts served, Khus Khus aur Makhane ki Kheer, mildly sweet with abundant cashews and raisins impressed hugely. 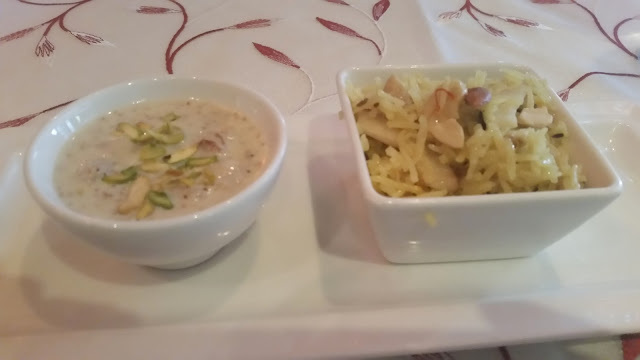 Meetha Bhath, the other dessert was a sweetened basmati rice; it paled in comparison to the kheer. It is great to see the culture of pop-ups starting off in Hyderabad – it gives the food lovers a chance to try out new things. Also, the trend of presenting lesser known Indian cuisines which is commendable. Kudos to the team at The Marriott for organizing niche promotions – their earlier concept “Earthen Flavours” was another promotion I absolutely loved.